“Why is my iPhone battery yellow”? If your iPhone battery life yellow then, in this article, we explain why your iPhone battery indicator turns yellow and give you solutions to fix it. Low Power Mode. When your iPhone activates low power mode, the battery icon turns yellow. This change usually happens when the iPhone’s battery indicator reaches 20%. At this point, a notification window appears asking you to enable the power save feature. 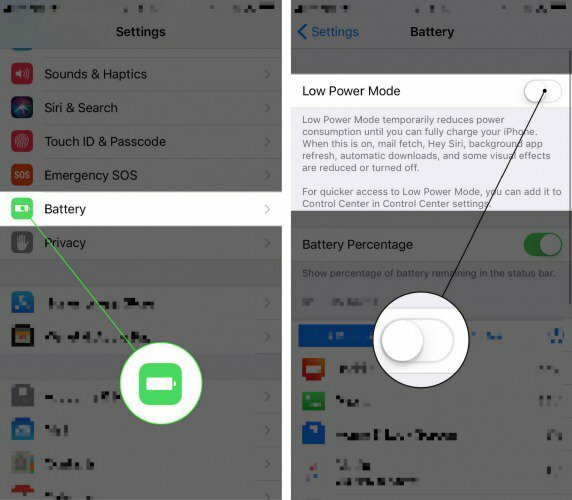 An image showing how to enable or disable low power mode on an iPhone. Luckily, once you charge your iPhone, the icon returns to the normal green color. However, it must charge to 80% or above for this to occur. Likewise, you can disable low power mode immediately to resolve the issue. Then, scroll to and tap Battery. Lastly, tap the toggle next to Low Power Mode, to disable the feature. Furthermore, you can add a quick access option to the control center for low power mode. You need to go to Settings > Control Center > Customize Controls, then select Low Power Mode to add it to Control Center. Did you panic when your iPhone battery indicator turned yellow? Then, you’d be happy to know that this is a normal occurrence on iPhone and iPad. The feature, low power mode, is the main cause. However, it is an easily disabled feature. Although, it is also safe to leave the feature turned on as well. What Does It Mean When The Battery Icon On My iPhone Is Yellow? Sometimes your battery icon turns yellow. Low Power Mode is a feature of the iPhone that helps extend the battery duration. It does so by making some changes in the functionalities in the phone. It dims the brightness, stops the push and fetch of mail, and stops services like Hey Siri! What Does Low Power Mode Do On iPhone? What is Low Power Mode? Low Power Mode reduces the amount of power that your iPhone uses when the battery gets low. The feature helps extend your iPhone’s battery life by reducing background data usage, disables certain animations/visuals, and other features. Why Does iPhone Battery Icon Turn Yellow, Red, Green, White, and Black? Your iPhone battery icon can be yellow, green, red, white, or black. It all depends on what you’re doing or what your iPhone is doing at the moment. Green Battery Icon = Charging (connected to power source). Yellow Battery Icon = Power Saving or Low Power Mode. White Battery Icon = Normal Icon Color. Black Battery Icon = This happens when you use certain backgrounds/wallpapers (no need for concern). Red Battery Icon = Your battery needs recharging soon. What Is The Normal iPhone Battery Icon Color? Normally, your iPhone battery icon is white. When you plug it in to charge, it turns green. There’s also a lightning bolt icon within the iPhone’s battery indicator during charging. Why Is My iPhone Battery Icon White Instead Of Green? As mentioned, white is the normal color. So, if you’re asking yourself “why is my iPhone battery icon white instead of green?” The answer is because it is not connected to a power source.